On my trip back from the States last year, one of the best things I brought back was a nice new Lodge Logic cast iron pan gifted by my awesome mum. That damn pan was heavy as @#$% but any qualms I had about it are long gone now as it's my go-to pan for cooking about 80% of the time. From durability to flexibility, the thing is a beast of a pan and is also perfect for cooking up some big slabs of meat when the craving comes. Interestingly enough, such skillet cooking is quite the rage in Korea these days with everything from pizzas, pastas, and even desserts being cooked and presented in skillets. But a particularly popular trend these days has steaks and sides being all served together in sizzling hot skillets. Steak is put on a pedestal and considered all things high class around here in Korea but unfortunately often times the quality is average while preparation are done in tragic ways with abysmal results. Whether using cheap (basically slabs of fat) cuts, overcooking them, or dousing them in weird concocted sauces (the Outback chain last year even had a steak with blueberry jam and cheese on it), sometimes one gets riled up wondering how to get a decent steak on your plate. I was meeting a friend who had a day off from her work a while ago in the Samcheongdong area when we became cold and hungry at the odd hour of 4 PM. Since we had already done coffee we were a bit lost on what to do next when my friend suddenly suggested we go to the place I'm introducing today. I actually first saw Pan Steak 2040 on a Korean food program a few months ago and was already curious enough to search the place online. It's now become such a successful place that they take reservations every night and have even spun off a few other branches in Seoul. So successful are the various branches that for dinner, you'll have to jot your name down on their list during their break time from 3-5 PM. Beginning at 5PM they'll go down the waiting list to usher in patrons depending on when a table opens up. So we jotted our names down at 4:30 and walked around a bit more. When we returned at 5 PM, we were led inside to a waiting room in the back where crowds of others were already waiting their turn. Luckily, we were second on the list so we were seated almost immediately. The layout is pretty crammed with tables so it's not at all an intimate setting. The kitchen is entirely open so you can watch them prepare the skillets, salads, and other dishes in front of you although it certainly adds to the noise levels of the already boisterous environment. 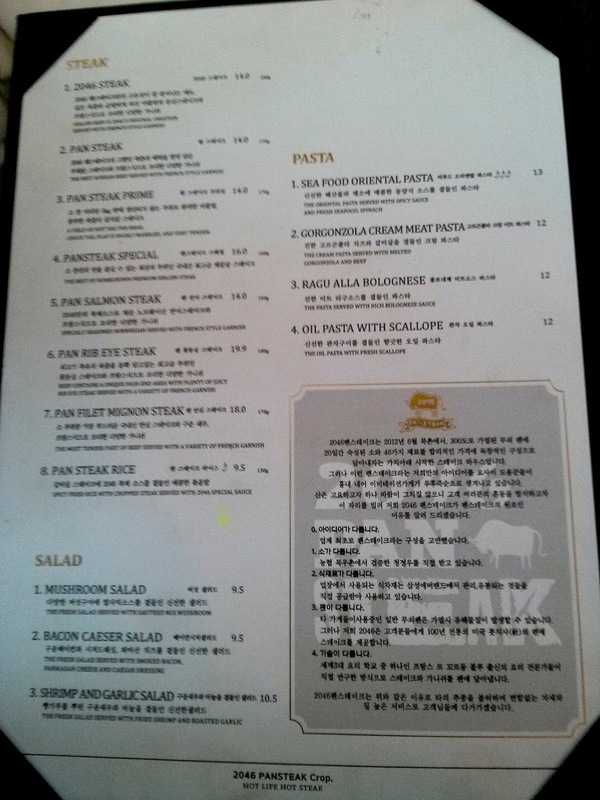 The menu is kept to a simple offering of steak, salad, and/or pasta. The steaks are the main draw here offering all kinds of cuts from sirloin to rib eye and more. All steaks are between 150-180 grams and priced reasonably between 14,000 (the chuck steak) ~ 19,900 (rib eye). There's also a salmon steak (14,000) won for those who aren't keen on beef. Salads go for between 9,500~ 10,000 and includes varieties like mushroom, bacon caesar, and shrimp and garlic. Pastas are between 12,000 ~ 13,000 and include your standard variations with seafood, heavy cream, olive oil and such. 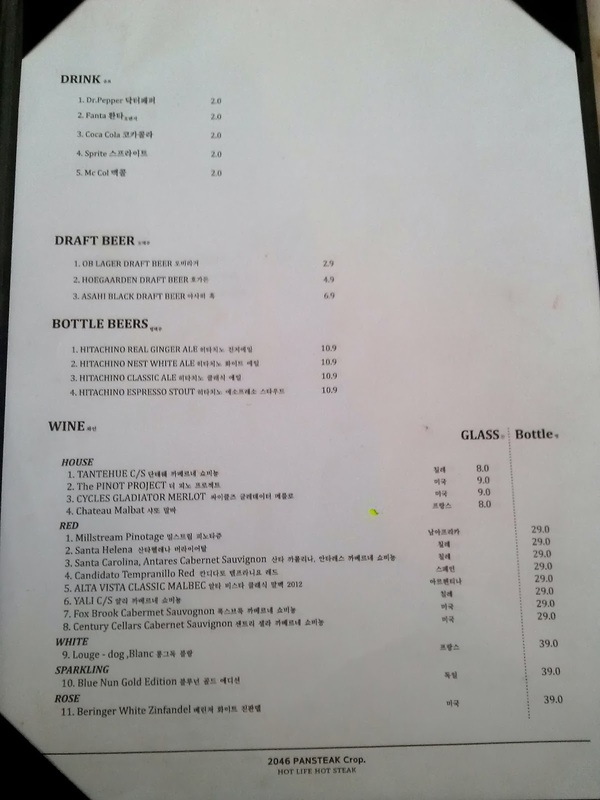 Draft beers, bottled beers and wine are offered which you can see below. The draw about Pan Steak 2040 is that they claim to be the originator of the skillet steak trend in Korea, having set up shop in June of 2012. I guess the imitation pan steaks all around Seoul, and Korea, irked them enough (as they naturally should be) that they actually have a blurb about it on their menu emphasizing they are the first and foremost of the idea in Korea. This is actually a valid concern on their part as there's multiple establishments that have already started up their own copy cat version. You can have assurance in knowing they're the OG, however (so long as what they claim is true). They also make a few other claims for reassurance; their beef comes from Australian cattle, inspected by Nonghyeop, and raised in the Cheongjeong region. Pan Steak 2040 also shares that its ingredients are inspected and distributed by Samsung Everland group (random) and that all its skillets are authentic Lodge skillets. Whatever you choose, the basic offerings are house-made pickles, a sweet Thai chili-like sauce and their steak sauce. The pickles are not too sweet while the sauce was ok and on the sweeter side but I would have preferred a bottle of A1. My friend and I ordered the Pan Steak Prime (14,000 won), the Pan Steak Special (16,000 won), and a shrimp and garlic salad (10,500 won). The place is open kitchen as I said so you can watch the chefs at work prepping the food and drink orders. It's a boisterous and lively atmosphere which, on the upside, has a friendly and laid back atmosphere for a steak place but on the other hand it definitely does not ooze a "romantic" feel by any means. In fact, the open kitchen and skillet cooking makes the entire restaurant more smokier than your neighborhood samgyeopsal joint and you're guaranteed to walk out from your meal here smelling like a walking, talking beef barbecue. The pan steak prime comes from the 살치살 or "salchi-sal" portion of the cow which comes from the area just past the short ribs. It's also called the "chuck flap" or "Denver steak" in the States and has steadily been gaining traction and fame for its meaty flavor and texture. Incorrectly prepared and cooked, flap meat can be tough and fibrous. But when cooked quickly on high heat via a medium like a skillet pan, and not past medium-rare, the flavors are extraordinary. Sure it's less tender than a cut like a strip or tenderloin but you just gotta let it cook for just a minute or so more when the pan arrives at your table before taking it off the heat, letting it rest and digging in. Just don't be overly eager to eat and cut with the grain like I did at first. Sacrilege! Let's face the facts that a true steak lover enjoys the beef steaks for its beefiness so for steak lovers in general, the pan steak prime is an excellent choice for maximum beef flavor- just let your teeth work to draw out the flavors from the fibrous cut and ye shall be rewarded greatly. The sides at pan steak prime is fixed and includes fresh spinach (which quickly wilts into a nice bedding for your steak from the hot pan) and an interesting mixture of mushrooms, peanuts, garlic cloves and sun dried tomatoes. Sure, they're not a baked potato with all the fixings or a Caesar salad but these simple sides worked well for me with my beef cuts and I especially enjoyed the side of assortment mixtures. My friend opted for the pan steak special which is the 채끝살 cut, or "chae kkeut sal", and known to us English speakers as the sirloin cut. The sirloin is one longer strip as opposed to the three or four cuts of flap for the pan steak prime. The sirloin cut is a step above in terms of tenderness from the flap and oh-so-very moist. It was quite lovely although if I had to pick, I still preferred my pan steak prime for its bolder and beefier flavors even if the pan steak prime is 2,000 won less than the pan steak special. I guess if you're more of a soft texture guy/gal, I'd say go with the pan steak special whereas if you're a more beefier flavors guy/gal, than go with the pan steak prime. Still, both were wonderful and, as my friend and I both agreed, both were a great deal for decent steak in Korea. The shrimp and garlic salad comes in a deep metal bowl in which greens are topped with spiced, golden shrimp, garlic cloves, salad dressing, and freshly shaved parmesan cheese. I liked the dressing, which wasn't overly sweet like many dressings in Korea, I liked the spices on the salad, the cooked garlic cloves and everything. But overall, the salad was too salty for my taste. The salad, which was supposed to be a lighter accompaniment to the gut-heavy steaks, began taking on a hefty and heavy weight in my stomach so we enjoyed it far less as we got to the end of our meal. I suppose for those with a big appetite and lover of fried and greasy foods its no big deal. But as a salad, I wish it was a bit simpler with perhaps some simple grilled shrimp on top and going easier on the dressing. I have doubts Pan Steak 2040's bacon Caesar salad will be any less heavy or sodium enriched but if I do go for another salad on a future visit, I'm open to trying the mushroom salad. At the end of the meal, a tiny skillet with complimentary fudge brownies are provided with your meal. Nothing particularly noteworthy about the brownies but they were tasty and soft while my friend couldn't stop squealing about the tiny skillet and taking pictures. After paying, we generously spritzed ourselves with the complimentary Febreze outside as we literally smelled like the skillet pans we had finished eating off of. The quieter atmosphere of the Samcheong neighborhood, just as the sun was in its last few minutes on the horizon, came as a welcome relief from the loud, music-blasting eatery we had just walked out of. The atmosphere, the scents, the music and such at Pan Steak 2040 were all a bit much but what was certain was that the food, for the most part, was not- and it certainly was at a decent value. I thought to myself as I walked that if this place existed in the States, I probably wouldn't visit it again but being a beef-starved guy in Korea, I decided a little give and take was understandable for Pan Steak 2040's prices and went home satisfied and letting all who came within 100 meters of me know through the beef smells emanating from me. It's great value and the steaks are actually more than decent at Pan Steak 2040 if you can overlook its way too loud speakers blasting music, the endless smoke from all the pans, the oil splattering pans and the crazy wait lines. I'd recommend it as a place to go with friends (the ones you'd meet to get samgyeobsal in your hood) and not for a romantic meal for two with your S.O. Head out of Anguk Station exit 2 and walk straight. After walking about 200 meters you will get to a four way intersection with an elementary school ground visible in the street directly across from you at the intersection. 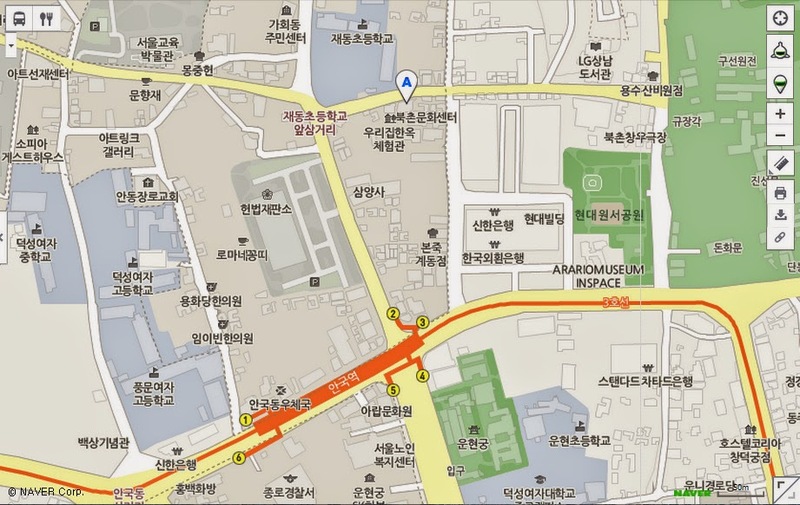 Turn right and walk straight about 90 meters (towards Changdeok Palace) and Pan Steak 2040 will be on your right. In addition to the main Anguk branch, Pan Steak 2040 has a branch near Jongak and a newly opened spot in Hongdae. Obviously bringing your vegetarian friend(s) here would be borderline cruel and insensitive but if your pescatarian friends don't mind secondhand beef smoke, there are seafood options including a salmon steak and a few seafood pastas... though I haven't tried any of them so I can't vouch for how good/bad they are.